when in Rome….. – Helen, Naturally! I have often wanted to visit the lovely city of Rome. Even the movie makes me dream of visiting and of the passion I may (or may not) find there! When in Rome…..do enjoy a lovely breakfast of oats! 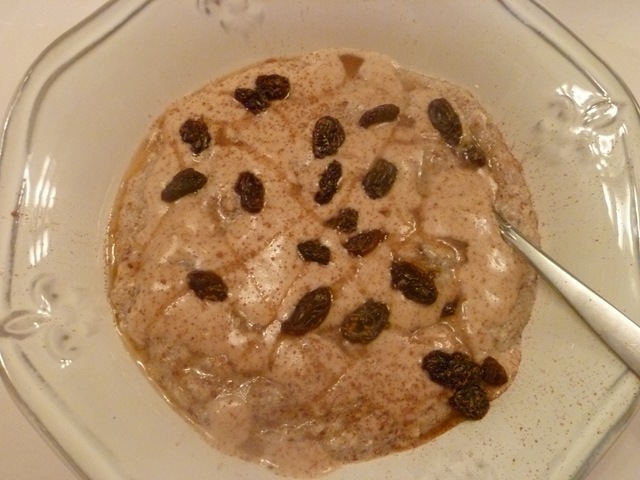 This is a different mixture than my normal whipped banana oats but still delish. 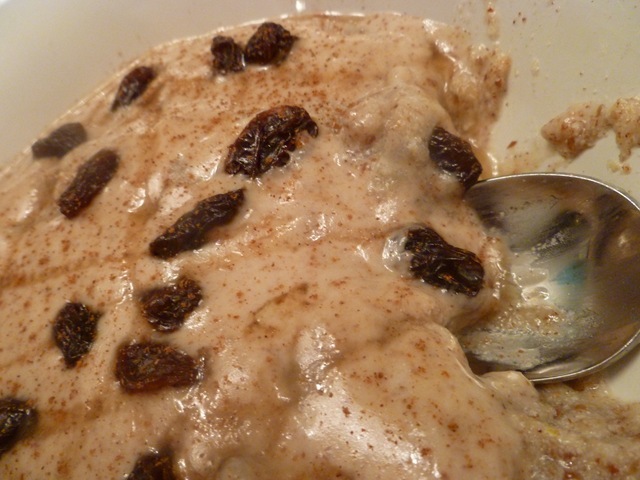 I used applesauce in place of the bananas this morning, and enjoyed a wonderful bowl of apple-cinnamon-raisin oats drizzles with almond butter “syrup”, a little honey, and topped with more raisins and cinnamon. Yes I am addicted to cinnamon! Heat the water and milk on the stove. Add a dash of salt. When it starts to boil stir in the oats, flaxseed, and protein powder. Cook until desired texture. 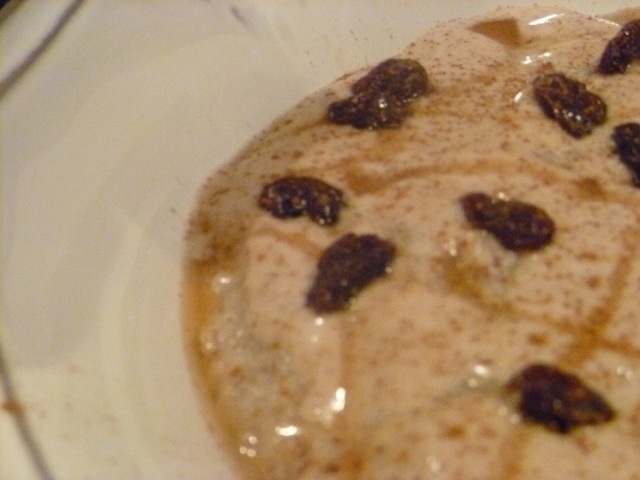 Stir in 1/4 cup applesauce, 1/4 cup raisins, vanilla extract, and cinnamon. When in Rome……do not eat apples! This is a Rome apple that I picked up at the produce stand over the weekend. I was not impressed by it 😦 I love my apples! I usually purchase gala or pink lady, honey crisp is my favorite but difficult to find now. This apple reminded me of a basic red apple. It was really soft but not as sweet. It was an okay apple, but I may not buy anymore of these. I would like to think that I just didn’t get a good one. 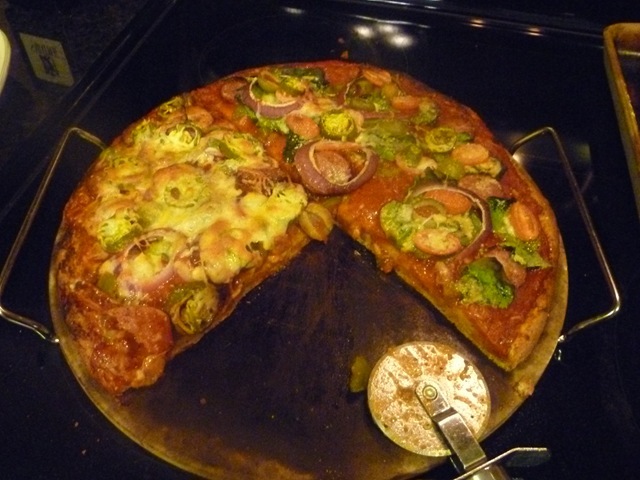 When in Rome……do enjoy a slice of home made pizza! This was phenomenal! 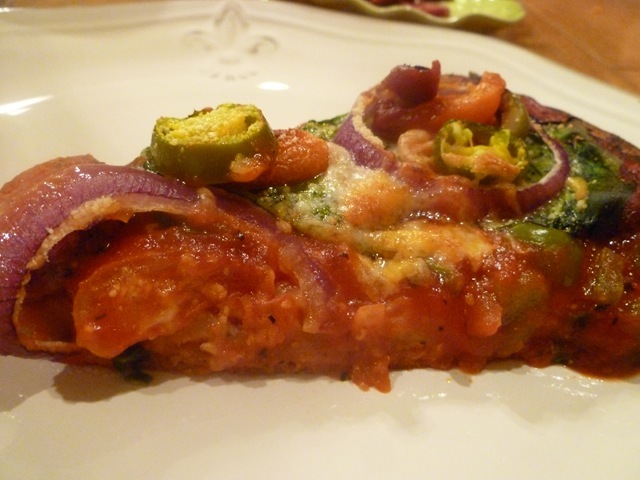 I used Angela’s pizza dough recipe substituting part of the all purpose flour for wheat flour. It turned out great 🙂 I topped the hubster with venison sausage, red onion, green olive, sliced grape tomatoes, jalapeno, and lots of cheese. My half of the pizza was topped with a little venison sausage, sliced grape tomatoes, a few green olives, a few jalapenos, red onion, spinach, and parmesan cheese. The kiddos enjoyed a basic cheese pizza. Mix together 1 cup flour, salt, honey, herbs, and yeast. Stir well. Now quickly add in 2/3 cup warm water and 3 T of olive oil. At this point the dough will be sticky and wet. Add in the other cup of flour, gradually, as you stir. Once all the flour is in, place the dough on floured surface and knead for about 5 minutes, adding flour as needed. 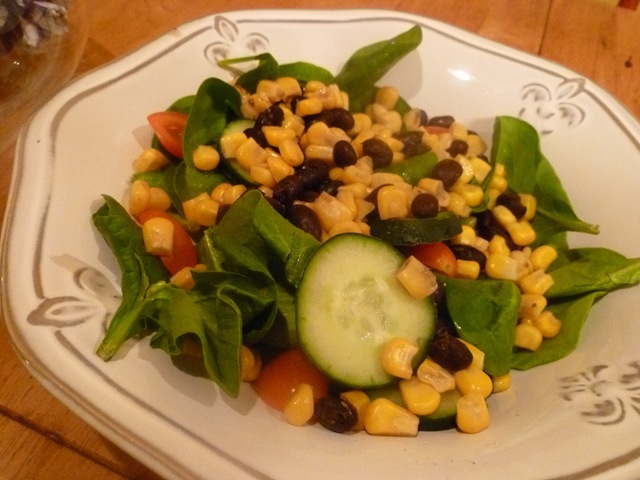 Form the dough into a ball and place in a large, oiled bowl. Cover the ball with a little oil so it doesn’t dry out. Cover the bowl and let it rise for 1.5 hours. You can punch the air once half way through the rise. Dust a pizza stone, or pan, with corn meal. 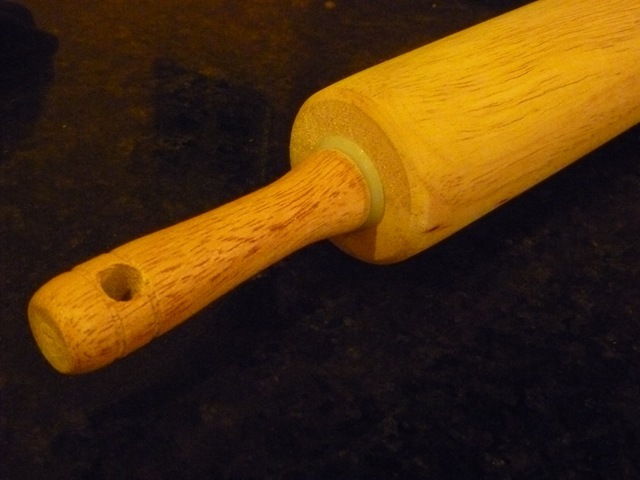 Take the dough and carefully roll out to desired shape/size. Mix together 1 T olive oil and 1 clove minced garlic and brush over the dough. 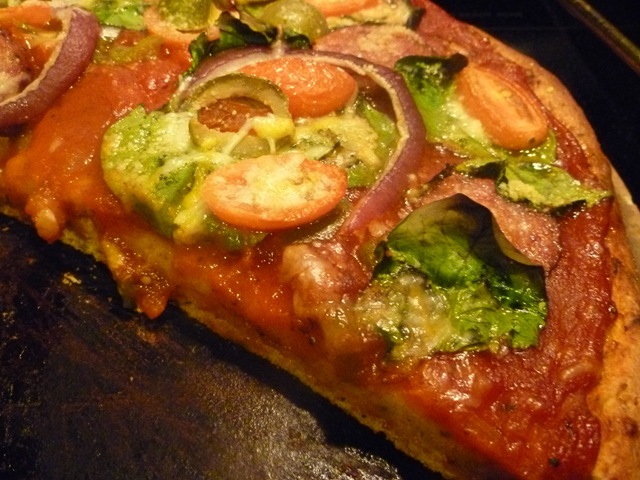 Add basic tomato pizza sauce and toppings of choice. Bake int eh oven at 500 for 15-20 minutes. When in Rome…enjoy some cookie dough balls! Oh wait, shucks someone at them all. The boys couldn’t stay out of those things. Oh well no dessert tonight. When in Rome…..enjoy a long hot bath with a good book and chai tea latte! That is where I am heading folks! Now just replace “when in Rome” with “when at Helen’s” and you’ve got my day rolled up in a nutshell! 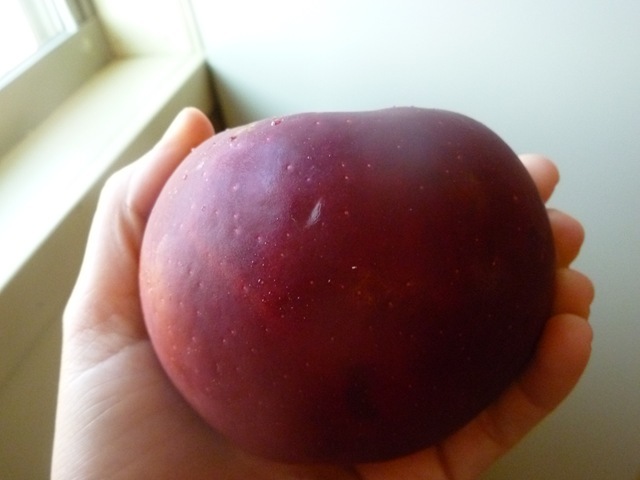 Have you ever had a bad experience with a fruit that you would normally love? Did you try it a second time just in case you had a “bad apple” (pun intended..ha! )?